Here's where Scott's Supreme Court basketball games are held. 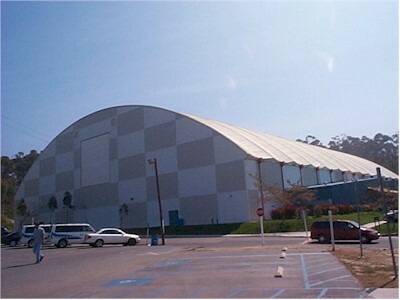 It's a huge field house at Alliant International University (formerly called U.S. International University), which is a few miles south of us in the neighborhood called Scripps Ranch. Today, Scott's team lost twice, but played pretty well in both games. Scott played for most of the second game and had 4 points and a few assists and rebounds. Matt is hosting a Key Club event here at the house this afternoon. He and a few other kids are sorting candy for a candy sale at the school this week.